Not all presentations can be full of thought-provoking photos. Many times you need to present data — lots of it. 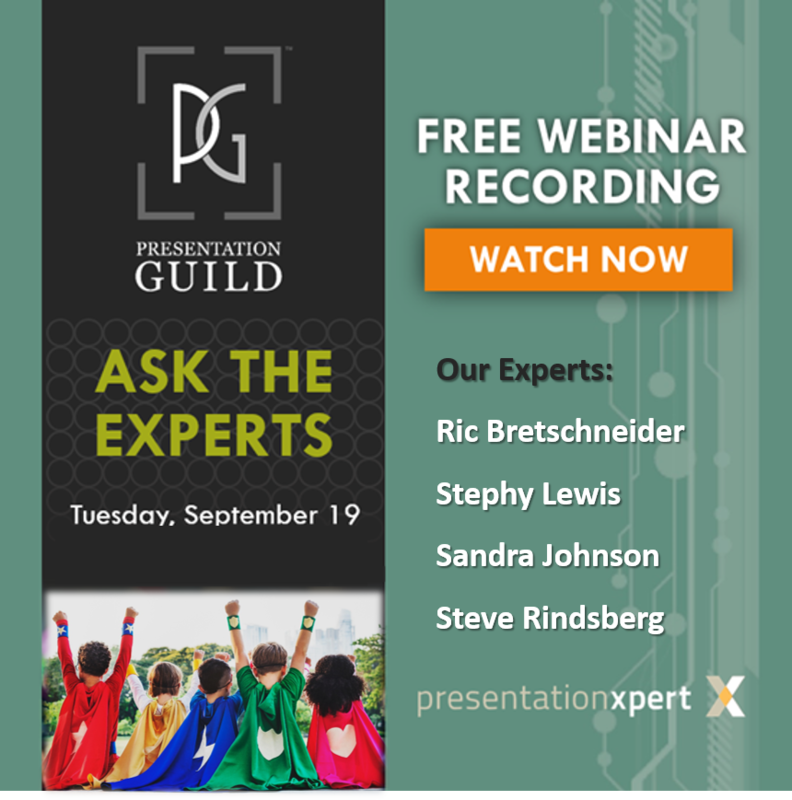 While I do think that presenters sometimes dump more than necessary on audiences, consider this scenario that demonstrates how good handouts can save the day. In the Northeast, how many boys aged 13-17 read email on their phone, tablet, PC other? How many girls? And the same for 18-24, 25-29, 30-39, 40-49, 50-59 and so on? Similar data must be gathered for other areas of the country. Let’s say the company wants to create different ads in different markets showing people using their email software. They want models in the ads to be using the device that’s most prevalent for that market. So ads directed towards women in the South who are 30-39 might be different from ads directed towards men on the West coast who are 18-24. The product marketing manager wants the data, but she also wants you to present it, explain what it means and describe how you gathered it. Several other people from the product group will be there, so it’s a meeting, not just a one-on-one discussion. The data is just a big spreadsheet. The spreadsheet is too big to fit on a slide that will be projected on a wall and still be readable. But you want to create slides because you have some conclusions and thoughts to add, and the manager expects you to have those slides for the meeting. You’re going to have to create printed handouts or electronic handouts that people can view on their own devices, close up. 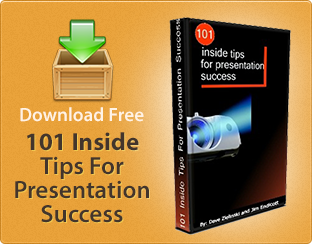 Yes, you’ll have slides, but you’ll supplement them with handouts. You can put some of the data in the Notes pane. (Click the Notes button if you don’t see the pane.) Then you can print the Notes pages either to paper or to a PDF file. You can put any text you want in the Notes pane, but formatting data is difficult. 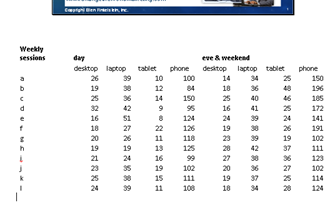 Using tabs, you can create a table. You can also copy data from Excel and paste it into the Notes pane. Use the Text paste option to keep the table properly formatted. You can’t put a chart or image in the Notes pane — just text. In PowerPoint 2013, choose File, Export, Create Handouts and click the Create Handouts button. In 2010, choose File> Save & Send> Create Handouts> Create Handouts. In PowerPoint 2007, choose Application button> Publish> Create Handouts in Microsoft Office Word. 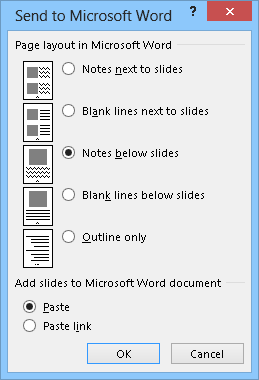 In the Send to Microsoft Word dialog box, choose Notes below Slides. That gives you the most room for your data. You can now copy and paste data easily from Excel to Word. The result is a table that you can format as you want. Here I left the default formatting. Another solution — one that many people don’t think of — is best for when you won’t be projecting slides at all. 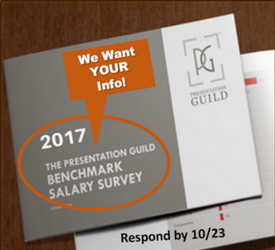 It isn’t uncommon for slides to be printed only, never projected. If this situation applies to you, you’ll love this solution — use a letter-sized slide. You’ll get the best results if you don’t change slide size midstream and start with the desired size — but if you already have your smaller slides, go ahead and give it a try. When you are printing your slides, you can make the text smaller, since people are looking at the slides close up. Even so, don’t squeeze too much on a slide; you want people to get your point quickly. To set the slide size, click the Design tab. 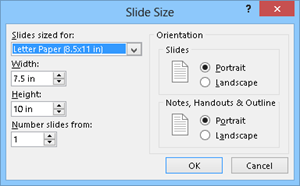 In PowerPoint 2013, choose Slide Size, Custom Slide Size. In PowerPoint 2007 or PowerPoint 2010, in the Page Setup group on the left, click Page Setup. In the Slide Size or Page Setup dialog box, choose Letter Paper from the drop-down list. Then under Orientation, you would usually choose Portrait for the slides. Click OK. Maximize: Keeps your content the maximum possible size. In case you’re making your slides smaller, this ensures that they don’t get squished. Ensure Fit: Resizes objects if necessary to fit them on a slide. 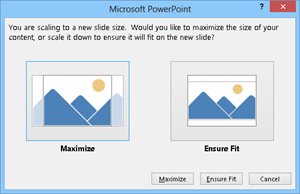 When you have a larger slide, you can easily fit more on it — using PowerPoint’s charting tools, table tools, etc. — without crowding.